The book of condolences will be open at the Consulate General of the Republic of Serbia in Chicago fallowing the tragic death of Sladjana Stankovic and Jovica Stepic, staff members of the Embassy of the Republic of Serbia in Libya during air strikes against terrorist camp in Libyan town of Sabrata. 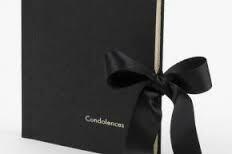 The book of condolences is opened on February 22 and 23, 2016 between the hours of 11:00 am and 4:00 pm. Address of the Consulate General: 201 E Ohio ST. Suite 200, Chicago, IL 60611.